This month, thousands of Houston residents spoke out to save curbside recycling and to challenge the notion that tossing valuable resources into landfills is a viable option for the nation’s fourth largest city. Houstonians emailed Mayor Turner and City Council, signed multiple petitions, made phone calls, testified at City Hall and spread the word on social media. The result: City Hall and their contractor responded to public outcry and made a temporary deal that will continue Houston’s curbside recycling with a short-term agreement. The two-year deal gives city officials the opportunity to explore other recycling contracts through competitive bidding and potentially bring more recyclers to Houston—which is exactly what we need to prevent one, huge company from having too much influence over a public service as important as curbside recycling. Not recycling glass curbside is a big step backward, and neighborhood drop-offs are by no means a perfect substitute. Less recycled glass means less energy savings and climate benefits, more landfill tonnage, and fewer economic opportunities in the glass recycling industry. Just because commodity prices for glass are low right now should not mean more glass going into landfills. This highlights one of the biggest problems we face in the waste and recycling conversation: the false economics and hidden costs that make recycling appear to be more expensive than landfills — in Texas, anyway. There are costs associated with trashing glass instead of recycling it—wasted natural resources, greenhouse gas emissions and long-term landfill pollution, to name a few—but since those don’t show up on Waste Management’s balance sheet, we get told that “glass has no value.” It’s a classic business externality. Of course, we want glass recycling to return and we want more recyclers to build facilities in Houston. But how do we get there? The solution is to start planning to divert more materials from landfills every year. 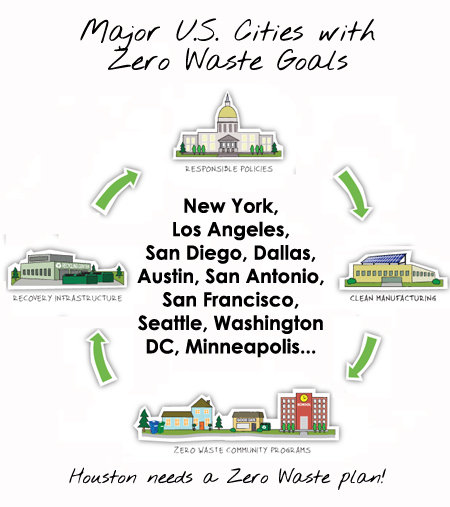 The next step to take today is to set a long-term diversion goal, or “Zero Waste goal” for Houston. What that means is making a commitment that Houston will divert up to 90% of waste from landfills within the next few decades. In case that sounds like a pie-in-the-sky notion, you should know that Dallas, San Antonio and Austin are already on record with Zero Waste as their goal. San Francisco is already recovering over 75% of its waste. Los Angeles is over 75%. Seattle is at 56%. And it’s not just cities. Walmart cited significant progress toward its Zero Waste goal as its top sustainability achievement last year. Toyota and Subaru are already both recovering over 90% of their waste. Xerox has a zero waste packaging and ink program. They’ve realized that it’s wildly unrealistic NOT to work toward Zero Waste—and we should too. According to the U.S. Environmental Protection Agency’s Transforming Waste Tool, a Zero Waste goal is the least difficult and first priority step that cities can take to transform a waste program that is dependent on landfills and incinerators into one where discards become resources for people to use through recycling, reusing, composting and new product designs. Some local residents have responded with different solutions, however, that revolve more around paying for services than how we craft the policies themselves. Since the City budget is approaching a revenue and expense shortfall between $129 and $160 million, some Council members earlier in the month suggested abandoning recycling instead of paying up $1-2 million more per year (since the alternative of landfilling all discards would mean nearly $2 million more in landfill costs). In response, the Houston Chronicle and others have proposed a garbage fee. It’s worth pointing out that a garbage fee could be used to incentivize recycling through a system known as Save Money and Reduce Trash (SMART) pricing or “Pay As You Throw,” which would allow people to pay less if they produce less trash. Texas cities like Austin and San Antonio do this by offering different sized containers. Having a dedicated source of funding for the Solid Waste Department would ensure its ability to plan for the future. A garbage fee is only useful, however, if its future is clear, transparent and if the public knows what the money will be spent on. It has to be part of a long-term solution, not just a momentary band-aid. Before we consider a garbage fee, in other words, we should adopt a Zero Waste goal and then see when and how the fee could be implemented under that plan. Our next step as an environmental organization is to launch an education program supported by a grant to TCE Fund from the Jacob & Terese Hershey Foundation. This will include an oral presentation that we can present to your neighborhood group, business or club. We will circulate new fliers through our door-to-door canvassing work with information on how to use the big, green bins properly (keep out the glass!) and why it is important for protecting our local ecosystems and environment. We are strongly advocating that Mayor Turner and City Council pass a Zero Waste goal as soon as possible. As we’ve seen over the past month, when Houstonians make their voices heard, together we can get things done.